The seventh sign of the zodiac, Libra is ruled by Venus, the Planet of Beauty. The ruling planet of Libra is the same as that of the zodiac sign of Taurus. In ancient times, Venus was the name of the Roman Goddess of Love and Beauty. The planet is supposed to grant the finest planetary influences. 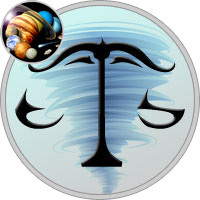 People of the Libran zodiac, dominated by the ruling planet of Venus, posses a very harmonious nature and strive for happiness and companionship. Some fine traits found in such an individual are beauty, charm, love of music and cheerfulness. Venus-rules people love to have comfortable surroundings and try to make sincere efforts for the purpose of creating the same. They love domestic life and their friends usually stay with them forever. The planet also has some negative effects on the zodiac, which is indicated by traits like lack of harmony and being too emotional in conflicts. Even the slightest neglect can offend them and send them brooding. Misunderstandings can easily crop up if they do not choose their friends carefully. People born under the zodiac sign of Libra, and ruling planet of Venus, may become careless and lethargic. They tend to move onto new friends and new fields if the affection they shower is not reciprocated. This makes them look like paradoxical to those people who surround them. Such people also tend to value the physical appearances more than the real worth of a person. Librans are also not capable of taking decisions during the times of emergency. They turn hesitant even on the face of danger. Such people adore and cherish all kinds of luxuries and classy living. They love to be a part of social functions, public gatherings, high end parties, etc. Those ruled by the Venus tend to have a balanced approach in life and superior tastes. They know that they can easily chem. people, but seldom show pride or haughtiness. Librans must have some sort of company all of the time, as they hate being alone. The planet of Venus is associated with the finer aspects of life like good food, drinks, marriage, fertility, etc. The metal associated with Venus is Copper, which tends to turn into pastel shades when heated. Venus affects the kidneys and the sensory organs of the body. It is associated with beautiful things, like daisies and daffodils; swans and dolphins; doves and beautiful birds, etc. The semi-precious stones that are related with this planet are lapis lazuli, cornelian, sapphire, etc. The lucky day for those ruled by Venus is Friday and the pastel shades of Pink and Blue are considered as their lucky colors. Gentle Libra is ruled by Venus, planet of beauty and love. Perhaps that explains your smooth talk and pretty face. Like Taurus, which is also Venus-ruled, Libras love to be surrounded by art, culture and beauty in a soft, harmonious environment. You love good food and expensive things. Lovely Libra knows how to charm but behind your dimples and sweet personality, you’re a fighter. Libra is the sign of the scales, and you can’t stand anything that’s unfair or unbalanced. You love a designer outfit as much as you adore a good debate. You’ll stand up for justice, and you’ll do it with style. Libra hates to be rushed–you prefer that everything happen your way, on your time. If that means you’re ten hours late, so be it. You’re a social butterfly who loves to be surrounded by people in a beautiful setting, talking and hanging out for hours. Just remember to save some time for yourself. Libras can get so caught up in the moment, they forget to handle their own responsibilities. Learn the beauty of being organized, and you’ll have all the time in the world to enjoy your beautiful life. The ruling planet for Libra is Venus.